If you see patients complaining about difficulty with their vision when at a computer, the following handout may help. Feel free to print this out with your practice logo and give it to your patients who complain of computer related vision difficulties. 6. Flicker in CRT monitors. The most common symptoms of CVS include blurred vision, vision that seems to fluctuate, and squinting. Other indicators of CVS include dry eyes, headaches, and pain in the neck and shoulders. If left untreated, most of these symptoms will not improve on their own and may even get worse. Here are several things to help ease, or prevent symptoms of CVS. Room lighting should be about the same or slightly dimmer than your computer screen. Working in an overhead-lit room with fluorescent lighting will only aggravate the symptoms. If possible, reduce the brightness of overhead lighting. Position your computer screen so it is or slightly below your eye level, 10 degrees below your line of sight is ideal. Position the screen so that it does not reflect overhead light or outside screen. Also position the monitor close enough so you can read the text without having to learn forward. Try to blink more often while working on your computer in order to avoid them getting dry. Dry eyes is the most common cause for blur or fluctuating vision on a computer. It is not always easy to remember to blink, so artificial tears used prior to computer use then hourly while at the computer can help. If you’re using an old CRT monitor, then it’s time to replace it with a new LCD monitor to help avoid eyestrain. CRT monitors give off a lot of glare which is not good for your eyes. 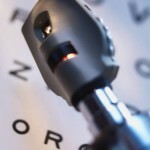 Get a complete eye exam by a trained professional. Your doctor may prescribe a pair of computer glasses that are specially designed to prevent computer vision syndrome. To reduce ‘focus fatigue’ try these simple resting techniques to help reduce spasms of the muscles around the eyes. 20-20-20: look away from the computer every 20 minutes at something about 20 feet away for about 20 seconds. 10-10: alternate looking at something distant, and something close for 10 seconds each. Repeat 10 times. Blink frequently during the exercise to lubricate your eyes. Drink enough water. Eye tissues are predominantly water. If you become dehydrated so do your eyes. Apart from the above recommendations, you can also minimize the symptoms of computer vision syndrome by giving your eyes a break from your computer at regular intervals. For example, you can use weekends as computer rest time when you greatly reduce your computer viewing time. Read previous blog post here. Optometrists, Ophthalmologists & Opticians Does Your Staff Know The Importance of Compassion?